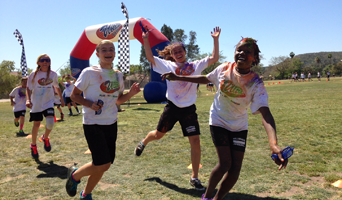 Ultra Fun Run is more than just a Jog-A-Thon. This is an event. Ultra Fun Run brings you the ultimate Jog-A-Thon event filled with inspiring music, encouragement and fun. Schools receive the highest profits in the industry with no annoying processing fees passed on to your community. With Ultra Fun Run there are no hidden charges. The digital lap counting system and all prizes, t-shirts and Jog-A-Thon supplies are FREE. Ultra Fun Run uses a state-of-the-art digital lap counting system that requires no volunteers to track student laps. Using this system allows schools to concentrate on the most important aspect of the Jog-A-Thon; the students. Ultra Fun Run is a full-service company that not only inspires students with a heartfelt, motivational kick-off assembly but, also takes cares of all the printing, student prizes, and online billing. As a bonus feature, Ultra Fun Run builds a custom, professional Jog-A-Thon school website for each and every school...FREE of charge. Ultra Fun Run utilizes a web-based pledging system that makes it fun and easy for students to request pledges from relatives and close family friends. Schools that use a professional full-service Jog-A-Thon company like Ultra Fun Run typically raise twice as much as schools who don't.